Charleston Chew Vanilla Mini's. A bite size candy bar a with chewy vanilla nougat inside covered with a delicious milk chocolate coating. Charleston chews are favorite old time vintage candy bar from the 50's. These bite size chews have the same great taste as the original Charleston chews just smaller, now you can eat more then one and not feel guilty. 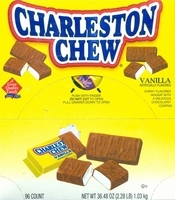 Charleston chews has been around since 1922, however the bite size version did not come out until 1998 and was immediately a big hit. The are the perfect size when you are looking for a little something to satisfy your sweet tooth. Pop these in the freezer for a great frozen treat. 96 bite size vanilla Charleston Chew per box. Each bar is approx. 2"